This is, I believe, the third boxing of the 109F-4 done by ICM since this kit was originally issued about a year or so ago, but the first time I've seen it. There has been much talk about ICM copying other kits and many may think that this one is little more than a copy of the Hasegawa kit. That is definitely not the case. While there are similarities between all kits of similar aircraft, this one bears little that appears to be in common with the Japanese offering. I should also mention that this kit has been selling very well in the US, selling out quickly whenever it appears on store shelves. First thing I noticed is that ICM has started using resealable parts bags and I find this to be a huge boon to keeping all the bits around once the box is opened. Once open, one finds four sprues. Two light grey, one darkish grey and one clear. 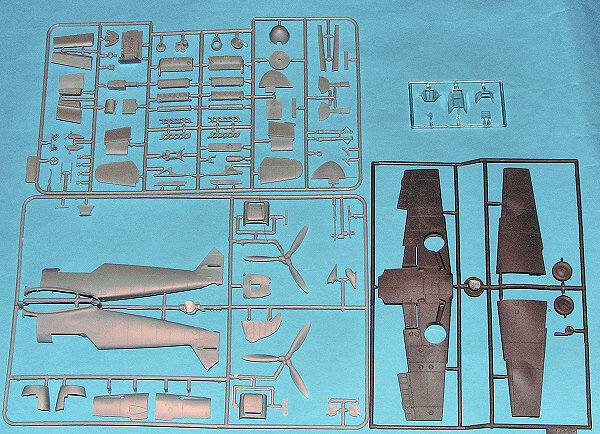 The clear sprue contains the three canopy sections and an armored windscreen addition and gun sight. These are very well molded though I do admit to seeing stress marks in all the panes. The kit provides a complete interior with seat, stick, rudder pedals and so on. There is also side panel detail . A separate rudder is provided, though it appears that it cannot really be made to sit at an angle without some additional work. the kit also provides separate wing tips. Not sure what is to be gained from this as I'd personally prefer them to be part of one of the wing sections to keep there from being alignment problems. Flaps are separate, though again, it appears they are designed to be in the neutral position. One also has separate upper and lower radiator coolant doors. Again, it seems these can only be mounted in the neutral position. I'm not sure of the reason for offering these bits separately if one cannot have them in different positions. But I've not built it to find if this is true. Slats are also separate and since the travel of these is so small, putting them 'down' shouldn't be a problem. There are several additional bits on the sprues that are not used, such as a spare prop of broader chord and another set of exhausts. There is also an unused 'trop' sand filter, though you could use them on some of the Russian Front options as they did have them installed on occasion. Instructions are well done with 8 construction steps and colors by generic and Model Master references. On the back of the box is one painting option in full color, that being of the box art plane of Yellow 4 from 9./JG 3. There is also a winter camo I./JG 54 plane from Leningrad front in March 1942, a yellow nosed 9./JG 52 plane from Ukraine in mid 1942, and a 6./JG 5 plane from Finland in July 1942. While I have to admit that all with have RLM 76 undersides, deciphering some of the other shades will be difficult as the JG 5 plane is listed as having Intermediate Blue as one of the upper surface colors and I seriously doubt this to be the case. ICM should also provide RLM shades where they are appropriate. 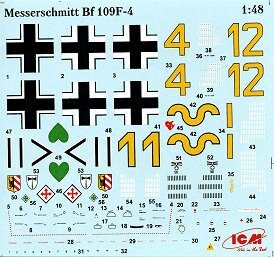 Decals are well printed though there is a bit of registration shift with the white parts of the multi-color markings so some trimming will be needed prior to use. 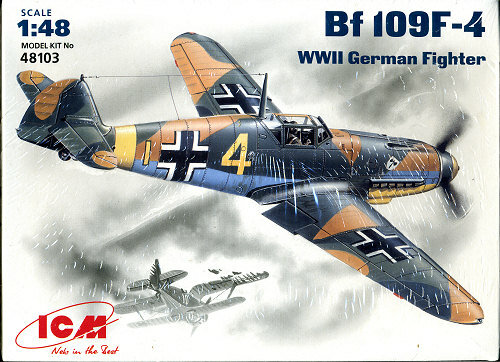 There are also a ton of aftermarket decals for the 109F so replacements shouldn't be a problem.